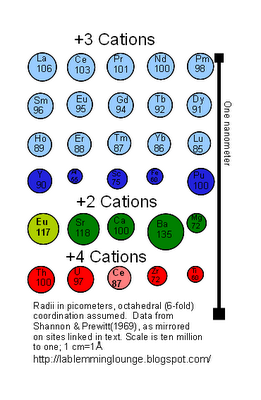 As I explained in the last Rare Earth Revelry, the ionic radius of the Rare Earth Elements decreases in a systematic manner with atomic number (figure 1, revisited). Figure 1. ionic radii of various REE and other elements (repeated from last time). As you can see, the ionic radii for aluminum and magnesium are quite small. Silicon (not shown) is smaller still. So the magnesium/silicon/aluminum minerals that make up the bulk of the Earth’s mantle have difficulty fitting the large REE into their structures. However, the mantle also contains calcium minerals, and this allows some of the REE, particularly the heavier ones, to squeeze into a calcium site under some circumstances. When the mantle melts, the melt has a much more fluid structure than the minerals, so it can accommodate the REE more easily. This means that during partial melting ,the REE generally partition into the melt relative to the residual minerals. The ratio in which an element partitions into melt vs. residual crystals is known as its compatibility, and is represented by something called a D value. The D value is the ratio of the concentration of an element in the mineral relative to the concentration in the melt. An element with a D value higher than one is compatible; it tends to remain in the mineral. An element with a D value less than one is incompatible. D values depend on the minerals present during melting, but under most circumstances, the REE are incompatible, and the light REE are more incompatible than the heavy REE. The degree of the difference in compatibility between the light and heavy rare earth depends on the degree of melting, and the exact minerals present in the residue. Garnet residues, in particular, tend to hang on to the heavy rare earth elements while excluding the light ones. Some examples of this can be shown in figure 2. This figure, from the lunar crust, shows the REE pattern of feldspar crystallized from the lunar magma ocean (blue line). The REE pattern is almost flat. In contrast, garnet is present in the deep terrestrial mantle where the magmas that bring diamonds to the surface form. Figure 3 shows the rare earth element pattern for one of these magmas, called a kimberlite. Figure 3. The REE pattern of a kimberlite. From Le Roex et al. The relative incompatibility is important for understanding the composition and economics of rare earth element mines, as will be discussed next week. The special SHRIMP issue of Precambrian Research came out last month, and is available here. Anyone interested in how a large ion probe named after a small crustacean facilitated the understanding of the first 90% of Earth history might wanna take a look. Although this trend may not be apparent for this week’s current weather patterns, the northern winters are getting warmer. While the optimists among us may feel that eventual progression from carbon-based energy sources to some other technologies may help resolve this problem, it is unlikely that such a transformation will be made anytime soon. So unless we all want to melt Greenland, some additional measures should probably be taken to keep the north pole cold. Such geoengineering proposals are often contentious. However, properly framing them may reveal surprising levels of support for modest measures. Here are two examples. 1. Clear the taiga. The boreal forest is a huge expanse of cold-climate conifer trees, which inhabit terrain that was either glaciated or tundra during the last ice age. These trees are adept at absorbing the springtime sun, and replacing them with flat, reflective snow would hopefully postpone the spring thaw. As the trees are a potential source of building and paper raw materials, cutting down the existing forests ought to pay for itself. However, should seedlings in these areas be allowed to regrow, then they would become a thicket of sub-economic sized trees which would still protrude from the snowpack. So a yearly cull of small conifers would be in order, to keep the flat ex-forested plains flat and snowy. Supporters of this idea could assist in this by creating a market for small felled conifers. As such trees lack inherent utility, they could potentially become decorative items, to be lit up by representations of the boreal winter’s 24 hour stars. Supporters of this proposal could signal their support by displaying a small severed conifer in their homes during the time period leading up to the northern winter solstice. 2. Eliminate the ozone. Ozone is a greenhouse gas. It traps heat in the atmosphere that would otherwise escape into outer space. It also adsorbs UV light, so simply eliminating all of it would make the surface of the earth uninhabitable. But during the polar winter, there is no solar UV to block, so a temporary elimination of ozone in the middle of winter would allow cooling without the complications associated with destroying the entire layer. Trouble is, our current system of ozone destruction using chlorofluorocarbons does not work during the winter- it works in the spring, once the sun has come up. So some other method, such as aerosolizing a solid ozone-destructing catalyst (like this) would have to be used, so that the catalyst would be out of the system by springtime. Even so, there would be a temporary increase in UV as the ozone layer rebuilt during the arctic spring. And this would have a carcinogenic effect on northern animals, especially their exposed body parts, like noses. Still, giving a few reindeer cancer may be the price we have to pay for saving the planet, so I suggest anyone who things this is a good deal should display picture or statues or reindeer with swollen, cancerous red noses. Although geoengineering can be contentious, canvassing the level of support for these particular suggestions should be easy. Simply look for homes where severed conifers or cancerous reindeer are being celebrated and displayed, and if such places are common, then the obvious interpretation is that the inhabitants of such houses are in favor. See also: Santa boycotts coal. I've been busy running two SHRIMPs all week, and I gotta explore a new isotopic system on one of them this weekend. So I won't have a REE update this week. In the mean time, I have a question for any other bloggers who read this. Have you moved this year, and if so, where to? I realize my link list is hopelessly out of date, but put your new url in comments and I just might update over christmas break.